I don't want a lawyer, I want a waiter! Max is screaming at a mean looking cop: Yo, fatso, move on, I got a beer or two here! Paul: Five more beers and I'll be a cop, too! Max, behind bars: Hello, stewardess! The beer menu, please! 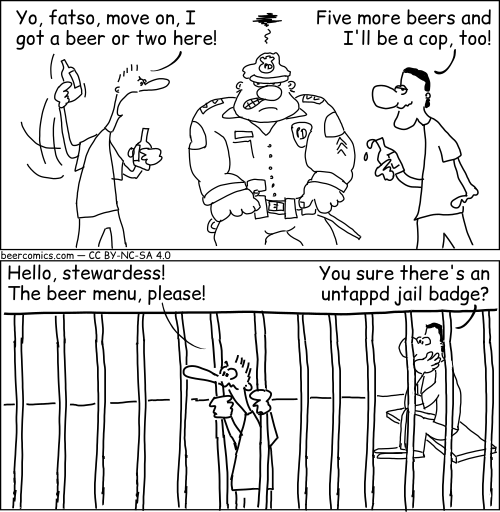 Paul sitting on the cell's bench: You sure there's an untappd jail badge? Jail badge by Robert Wenner is licensed under a Creative Commons Attribution - NonCommercial - ShareAlike 4.0 International License. Permissions beyond the scope of this license may be available upon request at https://beercomics.com/imprint.html.